You may have noticed over the past 2 years that our grocery shopping list has changed quite a bit since we’ve moved over to a keto diet. You might also have taken note that our many of our Sunday frugal recipes are low carb as well and this is because we no longer just eat what we want or classify as “healthy“. We have taken control of our eating habits and put more effort into what fuels our bodies and how we energize it each day. Related: Are you eating too much food? I’m not exclusively on a keto diet however I do follow it as much as possible as my dietary needs are different from Mrs. CBB. Coffee is a great start to the day for keto diet lovers. Many of you might be familiar with Bullet Proof Coffee and for those of you who aren’t let me tell you it’s packed full of fat! Some people have asked if the keto diet has interrupted our lean grocery budget of $265 a month for 2 adults and a toddler and it depends. Some months might be great and other month like August we went over by $18 although having the $25 stockpile comes in handy from time to time. Another factor to consider is price and sales. You may run out of almond flour and it just so happens to be on sale, you’re in luck. Cutting back on non-essentials really has helped our grocery budget forcing us to cook more, meal prep like pros (even though they don’t always work perfectly) and shop with a super-charged frugal mindset. We make our perfect cup of morning java the keto way but for many of you this coffee might seem overwhelming but trust me it is delicious and not in any funky, weird, kind or way. Bullet proof coffee is frothy and creamy comparable to a Tim Hortons hot English toffee or Vanilla Cappuccino. 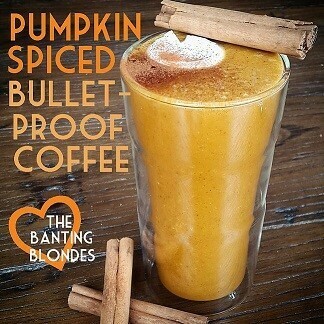 Just in time for Autumn you can start to enjoy Pumpkin Spiced Bullet Proof Coffee which I’m sharing from The Banting Blondes. 1 tablespoon Butter grass-fed is best but can be costly Kerrigold is popular and a Natural Irish Butter. Make your 2 cups of black coffee then put all the ingredients into a blender or use a hand frother and blend it up until creamy and frothy. We like the blender better as it really does a good job with frothing. The electric milk or coffee frother is great if you’re in a rush for work or having to get out the door quick. The Ketogenic diet also known as Keto or a low-carb, high-fat diet following suit with Atkins and other low carb diets and meal plans. What we love about low carb eating or the keto diet is the amount of experimenting we do with the products we purchase. The hardest part for newbies into the keto diet way of eating is having to eat high amounts of fat. To some it may be shocking that Mrs. CBB eats bacon more than the average person BUT it’s the fat content she needs. Reducing your carb intake and increasing fat puts your body into a state called, “ketosis” or that happy place for many low carb lovers. When we think of the Keto Diet we consider it a way of life not a diet to lose weight although that was what it started out as for Mrs. CBB. After having our first child and gaining 50lbs or so she knew she had to get back on track to where she was pre-pregnancy. Although running 5k every day hasn’t become part of her daily routine what she has incorporated is a new way of eating. The Keto diet plan needs to send your body into a state of ketosis where you are using the fat you have stored for energy as opposed to carbohydrates. If you fail to do this you won’t lose the weight and could gain so cheating on the keto diet is a BIG NO. If you do cheat start over the next day with even more motivation. You will get away with eating zero carb only if you stick to the same meals every day which would be limited but not impossible. Last year Mrs. CBB bought keto sticks from the pharmacy that test the amount of ketones in your urine. You may be familiar with these if you’ve been pregnant as most doctors ask pregnant women to check their ketone levels during doctor’s visits. You can buy a bottle of 200 strips for under $10 at Shoppers Drug Mart behind the counter. It’s not 100% accurate but it will give you a damn good estimate whether you have reached ketosis or not. All you need is a bit of colour change in the stick to be in ketosis. Sometimes people think the darker the urine stick colour the further into ketosis you may be. Unfortunately it could be the other way around and you are dehydrated. It’s very important to keep hydrated on a low carb keto diet because of all the fiber you eat. The last thing you want happening is getting constipated which is another issue that is hard to deal with (no pun intended). Mrs. CBB didn’t start with much of a meal plan for the keto diet however we did experiment with different recipes and then added our own touch. What we’ve learned is that if you stock all the main staples of a keto diet in your pantry and refrigerator you need it. What we do is then purchase produce, meats and dairy and we’re all set. Some of our more popular low carb keto diet recipes on the blog have been favourites we’ve been enjoying. All of these recipes are gluten-free, sugar-free and low carb perfect for keto diet maintenance. Lots more Low Carb Keto Diet Recipes available…. just read our Free Recipe Index. Your keto grocery list may differ from someone else depending on food allergies, grocery budget and availability. What I find interesting about the Low Carb Keto Diet is that it encourages people to cook otherwise you will fail. The Keto Diet is a masterpiece of dishes that will satisfy your tummy for hours. 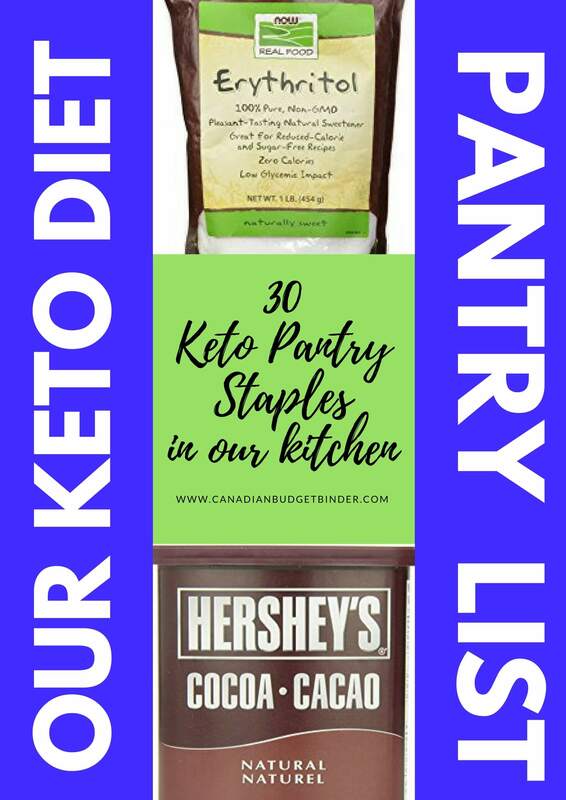 Below are a few products Mrs. CBB uses and recommends as part of her keto lifestyle and for anyone on a keto diet.If you don’t believe me I’ll take a photo of our overflowing pantry, haha! It will take time to build up a keto pantry so don’t get overwhelmed with all of the products. We bake and create recipes quite a bit so it’s important for us to have all of the keto ingredients stocked. We also tend to avoid buying pre-made Keto foods as they are very pricey and you can make them at home at a fraction of the cost. I will add more as I find more so you have a comprehensive list if you are just starting out. Collagen Peptides for hair, skin and bones. Cocao Nibs Great for smoothies, cookies or any baking. Coffee Grinder is a MUST kitchen tool but just a cheap one will do to grind up sugar substitute to powder and other spices. The idea is to keep full so you’re not snacking in between unless necessary or over-eating which most people do. When we eat the wrong foods that spike our insulin levels, look out. It can be hard to beat the carbohydrate giant. Most often we find that not all stores care keto diet foods so opting to purchase online is the next best option for keto foodies. Not all keto diet foods and supplements are purchased at the grocery store unless they have an Organic/Health section where they may be available. Most times we end up at the Bulk Barn, Costco and Popeye’s supplements for the little extras. You can also order tonnes of stuff from Amazon Canada with free 2 day shipping if you’re a PRIME Member on Prime products. Almost everything that is Keto or low carb is gluten-free so talk to your doctor if you think you’d like to try this way of eating healthy. I plan to do a master keto grocery shopping list to share prices and tell you why we buy what we do, where we do in an upcoming blog post. Keep an eye on the blog or better yet, subscribe so you get an email when I publish a new post. You can also download our 30 keto staples list printable and put it on your refrigerator for reference and motivation. Keep in mind that our Keto Diet/Low Carb pantry staples list is not inclusive as we have many other items that add to our meal plan. These are the essentials that are great to start out with when you are new to the Keto Diet lifestyle. Eat Eggs, Eat Bacon and Eat your Fat!!! Eat Fat Get Thin!! Discussion Question: What are some of your favourite low-carb keto diet staples that I haven’t listed and the best place to buy or order in Canada? We didn’t need too much since we had a load of vegetables and fruits dumped on us from the in-laws the past few days. We’ll be eating very good this next week or two. Looks like we went over in August but still great considering it was a 5 week grocery shopping month. Free produce did help though I have to admit. Sign up for the Nielsen Canada Home Scan Program and you can earn rewards points fast to redeem for awesome products or gift cards. I did this in the UK and loved it! I’ve heard of Keto Diet before. 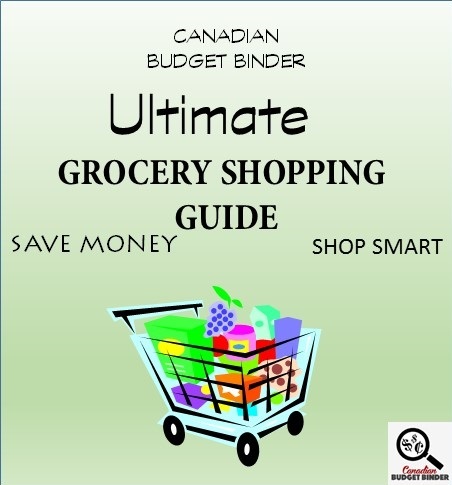 Thanks to your post I’ve finally learned more about it, as well as how to be healthy without going out of budget. Overview: Needed very little this week. No the Ramen Soup is made with Rice Vermicelli noodles instead of wheat so I can have the soup too. We use No Salt Chicken Stock and hit it with some spices or tobasco or whatever we are in the mood for in terms of heat, a handful of sliced green onions & finish it with a poached egg. What I like about the Olive Garden salads is the dressing, the fact that they are all-you-can-eat plus they will give me my own bowl that I customize to suit my health issues…extra tomatoes & black olives, no pickled peppers, no croutons & definitely no fresh grated parmesan cheese. 🙂 It’s a twice a year get-together with our girlfriend that we do. The bridge tolls to get there add up to $7.50 so we only do it a couple times a year. Olive Garden also makes an awesome virgin Caesar drink so we sit, chat & catch up on the last 6 months over lunch. Hubby and I were talking the other day about our grocery shopping habits… you know the drill. We’re all trying to buy less, shop less, spend less, waste less & sometimes what we are doing just isn’t working the way we hoped it would. The new rule at our house is…there will be NO SHOPPING until we have used up EVERYTHING we have on hand with a few notable exceptions – milk, bread, eggs, onions, carrots & celery will be re-stocked as needed! I still need to make soups! I’m sure this method will save us boatloads of money PLUS I won’t have to penny pinch every week pouring over the flyers and devoting my energy to pounding the pavement in a ton of different stores. So, with the start of this new system…I will create a new reserve that is called the GGC Savings Reserve. It’s where I will stash the money that we don’t spend…and we can easily see how much we have saved as a result of this clean-out! I also plan to make large monthly transfer to the re-stocking reserve so that when the stock is depleted…we have lots of cash on hand to re-stock as sales become available. This month we kick off the GGC Savings Reserve with $34.47! I expect our meals will get really interesting with this new approach, the longer we are at it. It’s going to be all about shopping our pantry and the freezer until they are completely empty. So, the GGC at our house has begun! Sunday – Lunch – Birthday lunch with a friend at Olive Garden << mmm green salad! OUR NEXT USA SHOP IS SCHEDULED FOR mid-Sept! OUR CURRENT TOTAL UNUSED RESERVES ARE $1,482.97. This means the $1,274.44 that we carried forward from 2016 PLUS AN ADDITIONAL $958.85 that we have added in 2017, LESS $750.32 that we have drawn out for use in 2017. Funny you both should mention this because Mrs. CBB and I have talked about this way of grocery shopping before but it is tough. I am thrilled to hear both Larry and yourself are committed to this and can’t wait to see the results every week. 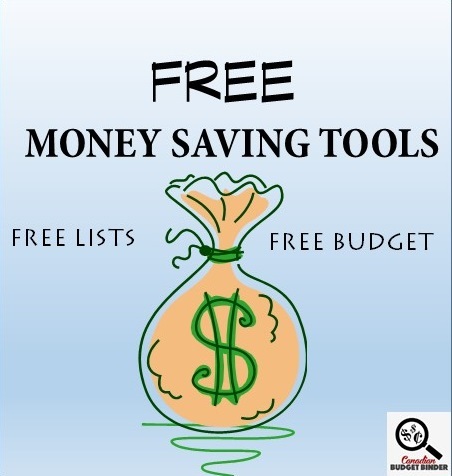 I love how you are so diligent with tracking numbers and finding the best savings for your family. It’s interesting to see the numbers and I often wonder why so many other people don’t take the time to do the same. What will you do with your GGC reserve? Chili and buttered onion buns… YUM!! When you make your chili what spices do you put in? I’m not a fan of heat BUT I don’t want chili to taste like pasta sauce, if you know what I mean. How do you make the Ramen soup or is that those packets? I have never been to the Olive garden before. What do you love about their salads?